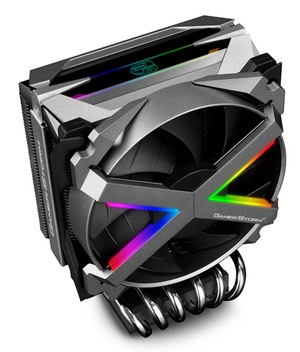 "DEEPCOOL also introduced its new FRYZEN air cooler, specifically designed for the Ryzen Threadripper series processor, supports AMD TR4/AM4 and all AMD Sockets and will be available in April, 2018. Ultra large copper base with mini-bumps and parallel arrangement of 6 boot-shaped heat-pipes perfectly cover the Ryzen Threadripper processors and offer extreme heat dissipation performance. In addition, exclusive metal fan frame with inverse double-bladed fans, offering twice the air pressure for twice the performance and 16.7M true color RGB flowing light system, in-built with 5 effects (dynamic color, static, breathing, comet, and fashion collision) for the top cover and fans for a total of 36 modes to choose from, meanwhile it supports Addressable RGB function with sync-control for the motherboard lighting."